Day 6 of the Sierra Challenge was the hardest scheduled for this year, with 24mi and almost 10,000ft of gain. It would be a very hard day indeed up the Taboose Pass Trail and I decided to opt out. This didn't sit well with many of the participants, but I simply chose to invoke my option to take a rest day, same as everyone else. Hours behind the frontrunners for the various jerseys, I didn't feel like I needed to keep up appearances for the sake of appearance. No, I've decided to allow myself to age gracefully and accept I'm no longer the same guy who started this whole thing 18yrs earlier. My day wasn't exactly a rest - I had in mind an unnamed peak in the White Mountains, about 3mi each way with an impressive 5,000ft of gain, all off-trail. It was my last peak on an obscure list entitled "Non-Sierra California 10,000-foot Peaks," a list that a few others had finished over the past few years and one I've been poo-poohing as rather contrived.. 70% of the peaks fall in the White and Inyo Mtns, not terribly exciting by my measure. Still, I'd been poking away at over the years and now seemed to a good time to finish the deed. There are two main options for climbing this peak, the NW Ridge (which I used) and the SW Ridge (which I intended). I tried two roads to reach the SW Ridge but found one way gated and the other seemingly dead-ending on ranch property. So I ended up driving to Benton and taking a right at the main intersection (a left turn puts you on SR120 towards Yosemite), drove to the end of the pavement a quarter mile away and then followed a very rough and rocky 4WD road for 2.6mi to the northeast towards Montgomery City, an abandoned mining site. Though not a long drive by mileage, it took something like 40min each way. I parked in the shade of the pine/juniper trees growing at the base of the White Mtns, in front of the NW Ridge. Starting by 6:15a, I found the hike entirely uninspiring. As the stats suggest, it's a fairly steep climb with few breaks along the way, all cross-country with barely an animal trail to help with the dirt, sand, gravel and rock slopes. There's nothing really treacherous along the ridge, only some minor brush to contend with, all class 2. Smoke from the Yosemite fires had spilled over the Sierra Crest to fill much of the Owens Valley, though most of the hike was above the smoke level. 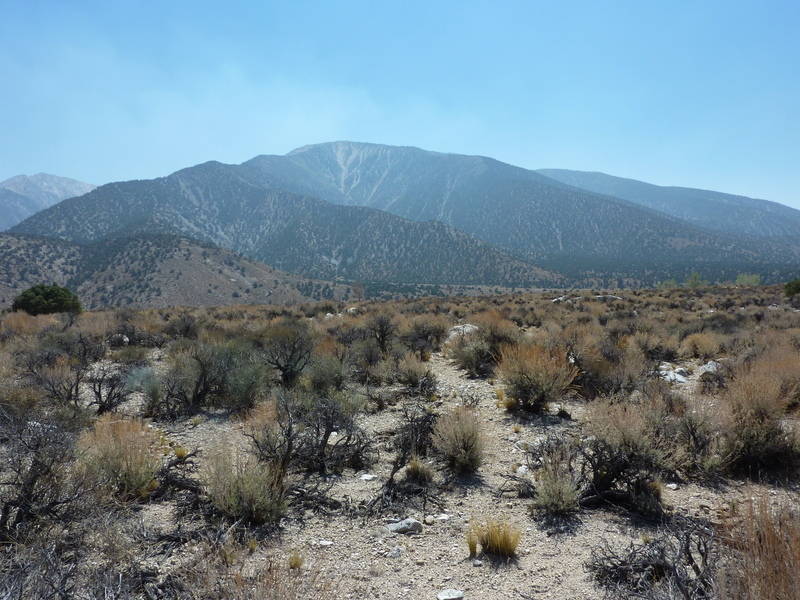 Still, views were muted at best, mostly brown haze with the higher Sierra summits poking through. I spent more than three hours to cover less than 3mi on the way up, a taxing effort. The ridge and gradient finally relented for the last 300ft of elevation as I turned east to find my way up sort-of green slopes to the highpoint. Montgomery Peak looms almost 2,000ft higher, 2mi to the northeast and is visible during most of the hike. A more ambitious party could continue up to the Inyo Crest at the Jumpoff, head north to Montgomery and then down Montgomery's NW Ridge to complete a circuit around the Montgomery Creek drainage. I was not that party.